GraceConnect » Welcome to the United States! Welcome to the United States! 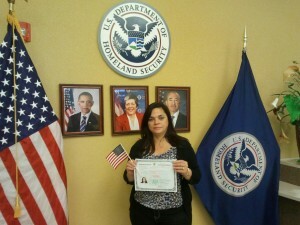 Our sister Migdalia Marquez, wife of church planter José Marquez, was sworn as a new American citizen last Thursday, January 17, 2013, in a ceremony in Tampa, Fla. She was born in Cuba, but now her citizenship is USA; however, she says that this is a temporary one because her real citizenship is in heaven.